Recently written up in the periodical “Country Living,” Long Branch, New Jersey has been touted as one of the “23 Best Small Town Main Streets in America.” And the main street in Long Branch, Ocean Avenue, runs right along the coast of the Atlantic Ocean. 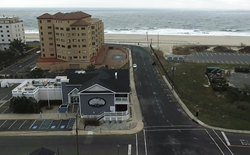 The award-winning Pier Village, a mixed-use beach front Victorian-inspired community, featuring dining, shops and services is a prominent attraction on the Long Branch oceanfront. Likewise, for more than 40 years, there has been another central meeting place on the Long Branch oceanfront; “Charley’s Ocean Grill.” Established in 1985 this traditional neighborhood restaurant and tavern, located at 29 Avenel Avenue, Long Branch, Monmouth County, New Jersey, has enjoyed a lasting reputation as a focal point of the community and a meeting place for locals to gather socially to enjoy an abundance of good food, drink and music. Over the past 12 years Charley’s has been owned and operated by the Pappalyiou brothers who tore down the little neighborhood bar in 2008 and erected a brand new two-story 9,000 square foot restaurant and bar in its place. The business increased tremendously following construction and the loyal local clientele who were sad to see their little old tavern torn down, welcomed their first-rate new environment with open arms and open pockets. When the Pappalyiou brothers decided to retire and sell the restaurant, they called on Allenhurst commercial real estate firm Bielat Santore & Company, to handle the transaction. That transaction closed on September 15, 2017 as reported by Richard R. Santore of Bielat Santore & Company, Allenhurst, New Jersey the broker for the sale. The new owners, seasoned restauranteurs, will continue to operate Charley’s as a family-orientated, family-priced and family quality restaurant and bar. “We believe that Long Branch has a bright future. There are many significant residential real estate developments that are breaking ground on Ocean Avenue along the ocean, and downtown on Broadway and Brighton Avenue. We plan on taking advantage of the influx of customers these developments will generate,” state Charley’s new proprietors. With seating for up to 250, including two spacious bars and two inviting outdoor decks with direct ocean views, Charley’s Ocean Grill not only offers a full ala carte and drink menu, it can also cater private affairs for up to 120 guests. The restaurant is open seven days a week for lunch, dinner and private affairs.